12 posts categorized "Bookshelf furniture"
In 2007, I started a blog category called “bookshelf furniture.” I wrote ten entries through 2008, and then my blog's focus turned to other topics. In spite of its title, there's nothing indecent about the site, though it does feature an obscene amount of bookshelves and related insights, quotations and links to articles. It's a primarily visual and incredibly thorough catalog. Check out its extensive archives. 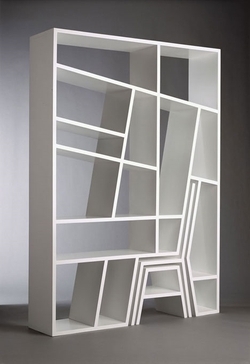 ° My blog category "Bookshelf furniture"
Look closely. This bookshelf, designed by Charles Trevelyan of Viable London, is imitating a word search puzzle. Once all furniture is found, a home mini-office, which very efficiently uses living space, is revealed. 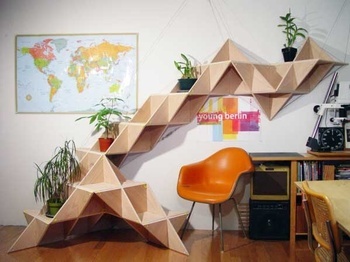 This piece rounds out the first ten items of this blog's growing "bookshelf furniture" collection. More to come. They see plants; I see books. The various incarnations of the classic bookshelf continue to inspire me. Add this one to a steadily growing category of "bookshelf furniture". Found at Below the Clouds. 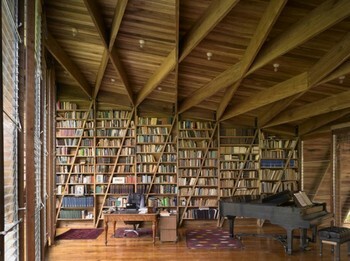 Being slightly obsessed with bookshelf furniture, I stared at this photo of a room, seemingly built around the books. 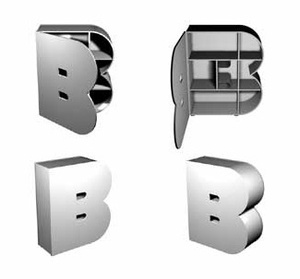 Because B is for "books", and this piece takes my blog category "bookshelf furniture" to a whole new level. Browse the gallery to see other examples of how to utilize these pieces. This product line is based in Switzerland, and I don't know if it is available internationally. Bookshelf furniture always catches my eye. I feature it on my blog whenever I find it and have created a category for it. This quasi-hexagonal pattern bookcase ( Opus Shelving by Sean Yoo’s ) is made with “expanded polypropylene”- same material used for the car bumper and motorcycle helmet. It is very light but very strong, can be used indoor or outdoor and 100% recyclable. It wasn’t designed specifically to be used as a book case. I’ve seen some people use it for storing wine bottles, children’s toys, CD’s, DVD’s, records, and even an occasional book or two. Found via NOTCOT — the source. This caught my bookshelf-lovin' eye. Distinctive and functional. Bookshelves with a bench is available for pre-order from designer Stanislav Katz. 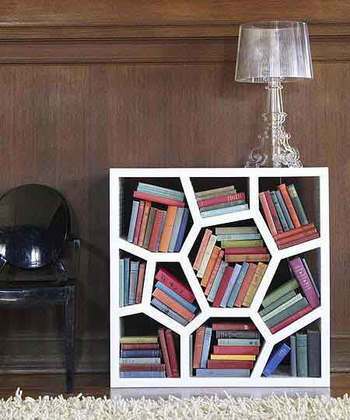 After seeing this, I finally created the post category "bookshelf furniture." This is the fourth such piece I've found in the last few months. 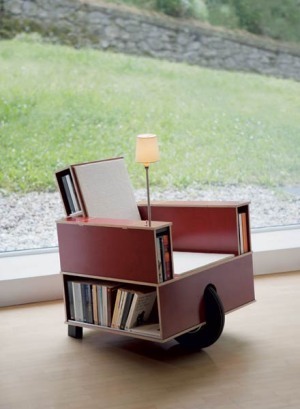 From Treehugger's "Bookinist: Crazy/Clever Chair for Reading, Thinking, Moving"
Designers continue to innovate in order to maximize space and keep books as close to their readers as possible. This 21st-century furniture design makes me think of a certain 20th-century "glass house." While we're warned not to throw stones there, traditional wall bookshelves blocking the natural light and obstructing 360-degree views would also damage its design. This type of furniture would fit in well. There will be more bookshelf furniture to come. I think this design sub-field hasn't been fully explored yet. The books/water combination theme continues here at "Write now is good." 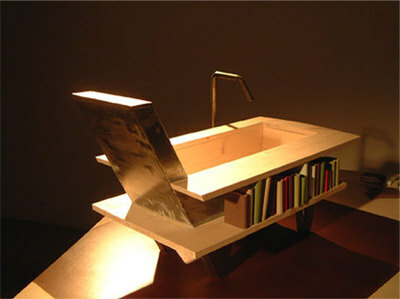 The Library Bath — A hybrid inbetween a bathtub, bookshelf and an armchair. If this, the bookshelf chair, and the bookshelf cave are any indication, traditional wall bookshelves are nearing extinction. I'm holding out for the bookshelf hot tub.